November will see the arrival of Royal Caribbean Symphony of the Seas, Norwegian Bliss and Celebrity Edge followed in December by Holland America ms Nieuw Statendam. These four ships join Carnival Horizon that began sailing from Florida in September. The five new cruise ships mark the largest influx of new hardware to the state in years. That includes technically the largest ship in the world in the form of Symphony of the Seas, which is the fourth Oasis-class vessel sailing from the state. It’s headed to PortMiami and the cruise line’s brand new terminal which has its ribbon-cutting ceremony on Nov. 2. The ship is set to begin sailing Nov. 9. Symphony of the Seas spent the summer sailing in Europe since its spring debut. It will actually make Port Canaveral its first North American stop, but at 2 a.m. on Nov. 8 to process immigration before heading south. While only incrementally larger than its sister ships, its maximum capacity is 6,680 guests with 2,200 crew. On its heels will be Norwegian Bliss, which will begin sailing from PortMiami on Nov. 17. Bliss had made a pit stop in Miami on its way to a summer of Alaska sailings. The 168,028-ton, 4,004-passenger vessel is a sister ship to Norwegian Escape, and the third in the line’s Breakaway Plus class of ship. Its signature feature is a 1,000-foot-long go-cart track that features 15 turns across two decks with vehicles that approach 30 mph. Also debuting in November is the first-in-class Celebrity Edge. The 2,918-passenger ship will begin sailing out of Port Everglades on Nov. 21. 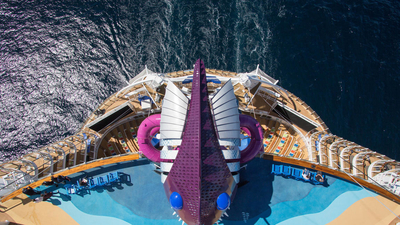 The 1,004-foot-long vessel’s unique features include the Magic Carpet, a large multi-use elevator of sorts that moves up and down the side of the 16-deck ship while playing the role of mass transportation, but also as an entertainment and dining venue. In December, Holland America Line debuts the second of its Pinnacle Class ships. The 2,650-passenger Nieuw Statendam mirrors sister ship ms Koningsdam with its “Music Walk” venues of the Lincoln Center Stage, Billboard Onboard and B.B. King’s Blues Club. New to the ship will be the Rolling Stone Rock Room, a venue formed in partnership with Rolling Stone, and in which will be a live five-piece band that chronicles the history of rock. It begins service from Port Everglades on Dec. 19. Carnival Horizon started the new ship part in September when it began year-round sailing from Miami on mostly seven-night Eastern, Western and Southern Caribbean itineraries. Like its sister ship Carnival Vista, Horizon features the suspended bike-like attraction SkyRide but also debuted the line’s first Dr. Seuss-themed water park and the new dining and brewery concept that married the Guy Fieri barbecue concept Pig and Anchor with an on-board brewery. The 3,934-passenger ship began Miami service on Sept. 20. All five ships are the largest ships ever built for each of their respective cruise lines (technically Horizon and Vista are the same size). With their debut, ships that had been sailing from Florida have shuffled to other ports including the departure of Norwegian Escape to New York and Carnival Vista to Galveston. Returning to Florida, though, and sailing for the first time from Port Canaveral is Carnival Breeze, which takes over for Carnival Magic which slides down to Miami. The winter sailing season from Florida is always the state’s most popular. Both PortMiami and Port Everglades will each see close to 30 ships using it as a regular embarkation point from November-May, while Port Canaveral will have up to nine, Tampa up to six and Jacksonville home to three. Wow! A lot of nice new ships coming to Florida...I would sure like to sail on the "Celebrity Edge." Love sailing from Florida, too. I can't wait to get on the Edge on February 17th. I will have to practice posting pictures on here so I can send some from the ship! It is supposed to be simply stunning. Can't wait to see the pictures, and hear all about your cruise! David was just asking me about the Edge, thinking it looks really cool. I said, yeah, Andi and Ed are cruising her in February. Too bad we can't go! Awww - why don't you come along - that would be so fun!